Ian James Campbell was born on August 21, 1931, in Valley City, North Dakota. Ian’s grandparents were born on the Isle of Skye and the Isle of Lewis in Scotland. They eventually moved to Canada to raise their family. Ian’s father, William, and mother, Chrissie, moved to Valley City from Manitoba. William was a doctor and had an active practice in Valley City. In 1944, when Ian was thirteen years old, William died of cancer. Chrissie and Ian moved to Los Angeles as it provided better job opportunities for Chrissie. In 1950, after graduating from Fairfax High School, Ian enlisted in the Marine Corps. 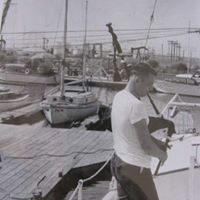 Ian served in the Korean War, completing two combat tours. Ian received an honorable discharge from the Marine Corps as a Staff Sergeant. 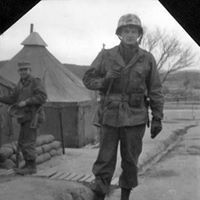 He was awarded the Marine Corps Good Conduct Medal, National Defense Service Medal, Korean Service Medal with four bronze stars, and the United Nations Korean Service Medal. 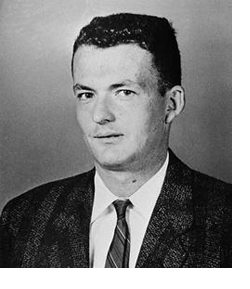 On May 5, 1958, Ian entered the Los Angeles Police Academy. After completing his probationary period in West Los Angeles Division, Ian transferred to Hollywood Division. Ian married Adah in 1958, and had two daughters, Valerie and Lori. 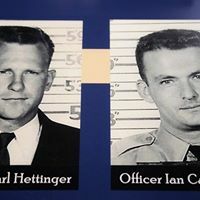 On March 9, 1963, Ian and his partner, Karl Hettinger, were assigned to Hollywood Division. Ian and Karl stopped a car with two suspicious people, Gregory Powell and Jimmy Smith. Ian and Karl did not know that Powell and Smith were both armed and looking for a liquor store to rob. As Ian approached the car, Powell took Ian as hostage. Karl surrendered his gun under the threat that if he did not Ian would be killed. Both officers were kidnapped. Ian was forced to drive at gunpoint with Karl in the back seat. They were taken to a deserted onion field near Bakersfield where Powell executed Ian. As Ian lay on the ground, Smith shot him more four times. Karl managed to escape. Both Powell and Smith were arrested within twenty-four hours of the murder. Joseph Wambaugh wrote the book, “The Onion Field” about Ian’s murder. 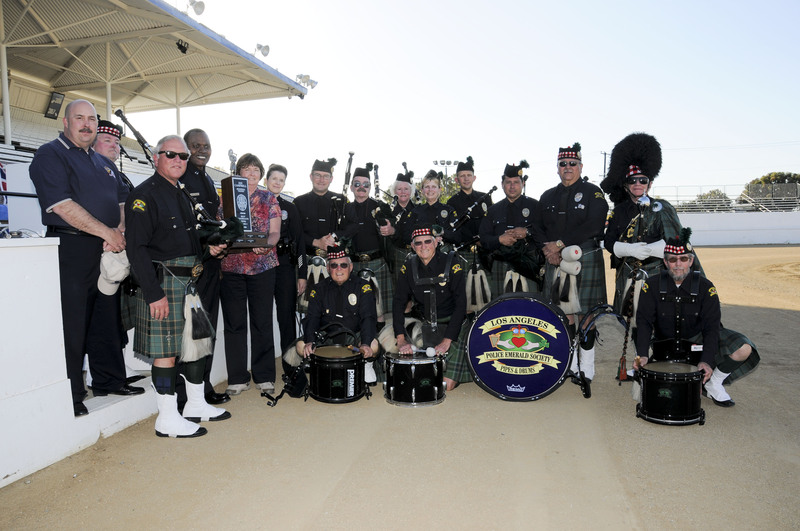 The Los Angeles Police Department, as a tribute to Ian, played bagpipes for the first time at his funeral. 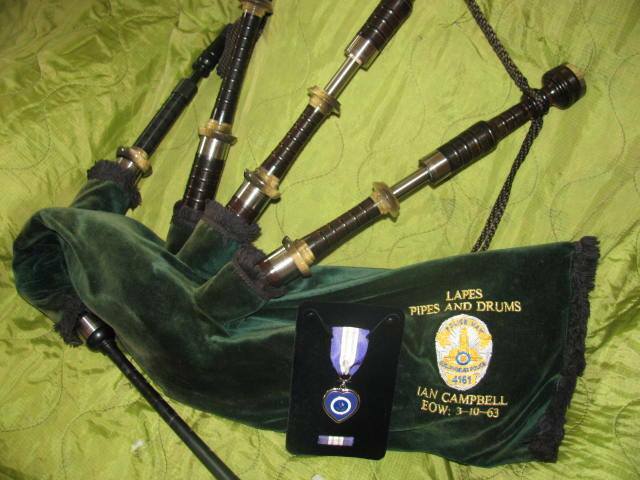 Since then, bagpipes have been played at every line of duty death of a Los Angeles Police Officer. In 1965, the Los Angeles Police and Fire Protective League sponsored the “Ian Campbell Memorial Trophy” at the Scottish Highland Games. The trophy was awarded to the best aggregate piper in the novice category. The trophy continued to approximately 1970. 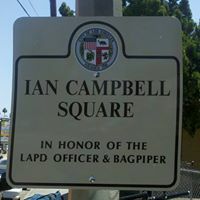 In 2012 Aaron Shaw of the the Wicked Tinker and friend of the Pipes and Drums wrote the Tune Ian Campbell LAPD. This is the first Tune ever written in memory of an Los Angeles Police Officer. Mr. Shaw played the tune at the 2013 “Cigars Under the Stars” Fundraiser benefitting the Pipes and Drums. Mr. Shaw donated an Original Score of the tune which was auctioned off at the fundraiser. Our Generous friends David and Julie Dugan were the winning bidders. In celebration of Ian Campbell’s life and sacrifice made in the service of others, you are invited to watch a fifteen minute video to honor Ian and his passion for playing the bagpipes. For decades the exact site where Ian Campbell and Karl Hettinger where taken to, “The Onion Field,” was not known. The passage of time and the changing landscape had made finding that location difficult. Earlier attempts to locate the site were unsuccessful. In 2011, the Los Angeles County District Attorney’s Office released documents and exhibits used in the criminial trial of Powell to the Los Angeles Police Museum. These documents are to be used in the LA Police Museum. On November 14, 2011 Retired LAPD Sergeant and LA Police Museum Executive Director Glynn Martin, Retired LAPD Detective and Independent Counsel to the Los Angeles Police Protective League Gary Ingemunson, Retired LAPD Sergeant and LAPES Pipes and Drums President Michael Apodaca, and LAPD Officer and LAPES Pipes and Drums Secretary Cliff Armas meet at the LA Police Museum. The four poured over documents looking for leads that would show the location of “The Onion Field.” A strip map of the scene was found and several pictures taken at the time of the murder. Armed with this new information, the four headed out to the Mettler area to find the exact site. The terrain had changed greatly and the construction of the 5 Freeway made finding the site difficult. In 1963 that portion of Interstate 5 Freeway had been not been constructed. The four went to the Mettler Ranch,which according to the strip map was located almost due north of the site. When the house was “door knocked” a female was home who knew of the incident and knew George Fry. On May 10, 1963, George Fry was a junior in high school when Officer Karl Hettinger came seeking help at their house. The female called George Fry. George agreed to meet the officers at his house. George knew where the site was and offered to took us to the site. Once at the site, all documents and photographs confirmed this was the exact location. Below is a video taken on November 14, 2011, documenting the search for the site and an interview of George Fry of what happened on that evening back in May 10, 1963, when Karl Hettinger came to running to his house. Untitled from mike abazaba on Vimeo. May 29, 2010: LAPES Pipes and Drums, Los Angeles Police League President Paul Weber, and Los Angeles Police Department Hollywood Captains Beatrice Girmala and Peter Whittingham present the Ian Campbell Memorial Trophy to Ian’s oldest daughter, Valerie Campbell Munoz. 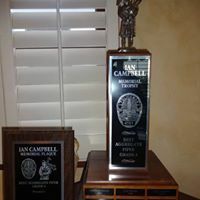 Ian Campbell Trophy. This award is kept at the Los Angeles Police Museum and progressive names are added each year. Awarded to the Best Grade Four Piper at the Scottish Games Costa Mesa Ca. To read the article on the Ian Campbell Memorial Trophy: Please click here.